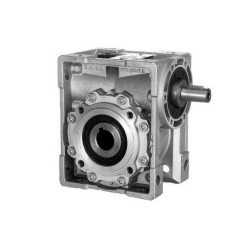 V50 i 1:10 /Holle as dia 28mm / WormGearbox Normal Backlash | DamenCNC B.V. This is a special version of the V50 gearbox. It has been made with a hollow output shaft of 28mm diameter. This is the same size as a variant 3 16mm ISEL ballnut. It can then directly be used to make a ballscrew drive.